Lunar Pal is the ultimate Moon companion. 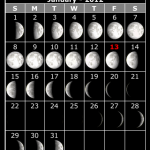 It includes large amounts of information about the Moon for current, past and future dates. 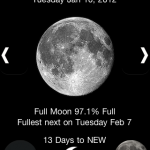 Lunar Pal visually allows you to see the current phase of the moon, along with other facts. It is the true astronomers friend, including the following details about any date: Moons age from new, Illumination, Distance from earth, Ecliptic latitude, Ecliptic longitude, moon rise, moon set, and Perigee / Apogee tables. The astrologists out there will be happy to see the Zodiac signs of the moon are also in here. 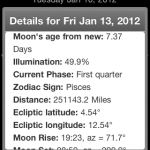 A calendar is included, when you tap a date, it will bring up more information for that date. I also have included an extensive help, reference, learning section. This will get anyone interested a good start. Knowing the current phase of the moon can be helpful for surfing, fishing, hunting, gardening, stock buying, moon photography, and of course astronomy. I have added everything I can think to add, but I am sure there is more. 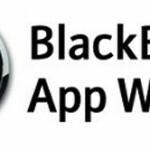 I will keep updating and perfecting the app as I get feedback. PLEASE email if you have a bug report, or feature request. I will gladly add any features anyone else thinks would be cool. Please don’t give me a negative comment to leave me a feature request! 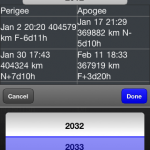 This program uses GPS to get accurate Moon rise and set times for your location.